Henry Benton Thorpe, Jr., known to most as “Bo” Thorpe was born in Rocky Mount in 1934. A graduate of Rocky Mount High School, he earned a degree from UNC-Chapel Hill, majoring in radio, television, and motion pictures. 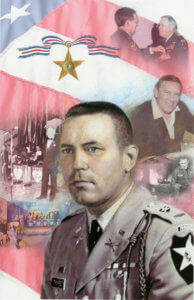 Mr. Thorpe entered the U. S. Army in 1959. In 1965, as a Captain and company commander in Ia Drang Valley, South Viet Nam, he led his unit gallantly throughout an attack by the North Vietnamese Army, an attack called the most savage one-day battle of the war. Although wounded himself, he ventured out to find pockets of his men separated from the main unit and led them back to their defensive position. On at least two occasions, he dragged seriously wounded soldiers back to safety. The book and movie, “We Were Soldiers Once … And Young,” detailed the events of this battle. His actions led to being awarded the Silver Star, the nation’s third highest honor for valor. Among his other military honors and awards are the Bronze Star with 2 Oak Leaf Clusters and the “V” device for valor, Army Commendation Medal with 2 Oak Leaf Clusters and “V” device for valor, Purple Heart, and others. After a short career in public relations, Mr. Thorpe pulled together musicians and singers from Nashville, Tennessee, to form “Bo and Generation II.” In 1978, he presented to members of the Rocky Mount community the idea of bringing back the city’s rich history of music which had spawned artists such as Thelonious Monk and Kay Kyser. His first televised event was on TBS in 1978 where he played for the New Year’s Party celebration. He started with his signature introduction: “Hi, Folks, I’m Bo Thorpe from Rocky Mount, NC, and this is my band.” From 1980 to 2000, he played at five Presidential Inauguration Balls. Bo Thorpe and his Orchestra toured the United States and Canada, doing over 60 shows a year. He and the band also played for many years at the annual Spring German, previously called the June German. The Thorpe family has been a part of the Rocky Mount community since the early 1900s, and although Mr. Thorpe traveled far and wide, Rocky Mount was home, and he was proud to be its ambassador. Mr. Thorpe died in 2001. History is alive and well in Edgecombe and Nash counties.